nTo create an environment outside the traditional classroom. nTo help students bridge gaps between art, science and design. nTo help students develop critical thinking through exploration and self-discovery. nTo create a logistically convenient area where students can sample, analyze, assess, and experiment with aquatic and terrestrial habitats. 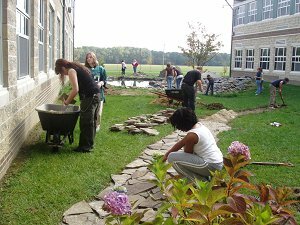 Students are encouraged to see any of the faculty team to volunteer to work and maintain this area. It will continue to change and grow as the years progress. 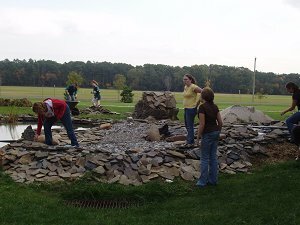 Our Learning Pond area will include a sculpture area, wild flower rock garden, herb garden, outdoor classroom area, etc.